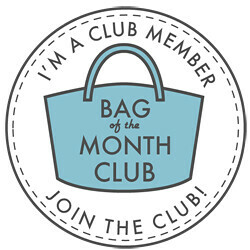 Look at this fancy badge I get for my site! 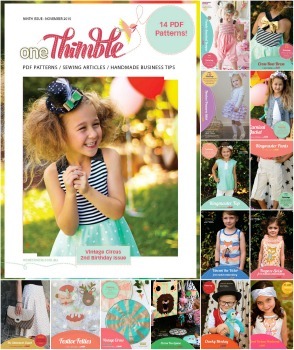 I'm so excited about this and have been keeping it a secret until now, but I have an article in Issue 9 of One Thimble Digital Sewing Magazine!!!! I joined the blog tour for the last issue and loved it so much that I really wanted to be a part of it. My article is an interview with some of my favourite designers: Janelle of Emmaline, Alicia of Swoon, and Samantha (Mrs. H). I really hope you'll grab a copy and read it. I loved getting to know the designers better and I know you will too! This issue is jam-packed with goodies! 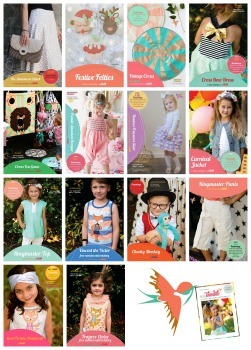 It includes 14 PDF patterns!! The Statement Clutch by Two Pretty Poppets looks like such a fun sew! I love a good purse pattern (as I'm sure you already knew)! I've yet to try one of her patterns, so I'm looking forward to this one. I also have a few turn locks that this would be perfect for. A few years ago I made an Advent Tree for my kids. Each day has a pocket with an ornament for the tree. Right now there are only a few handmade ornaments, and the rest of the days are bells. My goal is to make a couple ornaments each year so that eventually they will all be handmade. These Festive Felties will be perfect for our Advent Tree! And just in time! There's also a pair of Free Motion Applique patterns I'd love to try - I haven't tried this new technique yet, and I'm itching to give it a go. 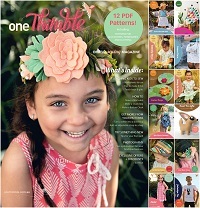 In addition to all the patterns, the issue is loaded with articles on techniques and tips, plus other project ideas. Go get yourself a copy! It would also make a lovely gift for a sewing friend. I'd love to hear what you think of my article; after you read it, come back and leave a comment. I haven't had a chance to read it yet, but I had to comment!!! WHOOHOOOOO that is amazing! Good for you, so proud of you, your really getting your name out there and doing an awesome job.